The United States Tennis Association (USTA) is offering a free USTA Junior Membership to all children age 10 and under. The membership promotion, which launched during the July 4 holiday weekend, is open to all first-time junior members until December 31, 2011. This special USTA membership offer will allow more kids to try USTA programming, including USTA Junior Tournaments and USTA Jr. Team Tennis. The special membership offer is part of the USTA’s innovative initiative, 10 and Under Tennis, designed to help get more kids involved in the sport. 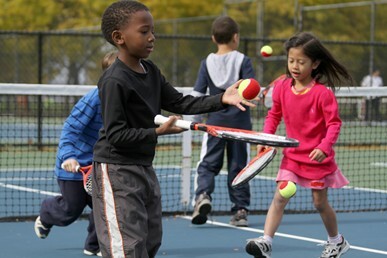 Similar to other youth sports, such as soccer and baseball, 10 and Under Tennis features equipment and courts scaled to kids’ size. Racquets are shorter and lighter, and courts are smaller. Balls bounce lower and move slower, thereby making them easier to hit and keep in play. Kids have fun learning the game and build confidence at the same time. These monumental changes to the sport make tennis more fun for kids by allowing them to learn and develop their skills in an enjoyable way, increasing the likelihood that kids will continue to play and continue to improve.